ABERDEEN PROVING GROUND, Md. --- While Soldiers wear camouflage to blend into the environment, it is also important to ensure ground vehicles are not easily detected. The Army now has a new advanced coating system for ground vehicles that suppresses ground vehicle heat signatures, making the vehicles much more difficult to detect. By working with the Army, CTC was able to tailor the GVCS to each system's requirements, allowing for future capabilities as threats change. 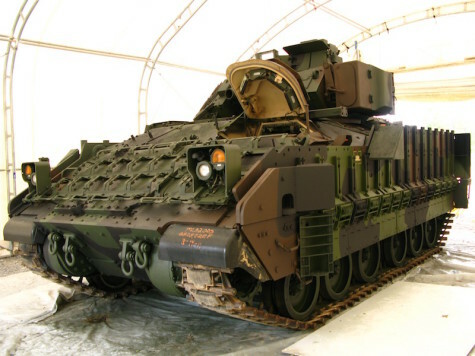 The new coating does not require additional space, weight or power requirements, which is especially important as the Army focuses on next-generation vehicles that are not only more lethal and survivable than current platforms, but also smaller, lighter and more fuel efficient. The U.S. Army Combat Capabilities Development Command (CCDC), formerly known as the U.S. Army Research, Development and Engineering Command (RDECOM), has the mission to lead in the discovery, development and delivery of the technology-based capabilities required to make Soldiers more lethal to win our Nation's wars and come home safely. The command collaborates across the Future Force Modernization Enterprise and its own global network of domestic and international partners in academia, industry and other government agencies to accomplish this mission. CCDC is a major subordinate command of the U.S. Army Futures Command.